30 sing-along songs, tunes & phrases! What’s the key to inspiring an early love of music and learning? The Fisher-Price Laugh & Learn Puppy's Piano that’s just the right size for your budding Chopin – and conducts some fun teaching along the way, too. Switch between Learning and Music modes by turning the page of the interactive book that’s attached to Puppy’s Piano. 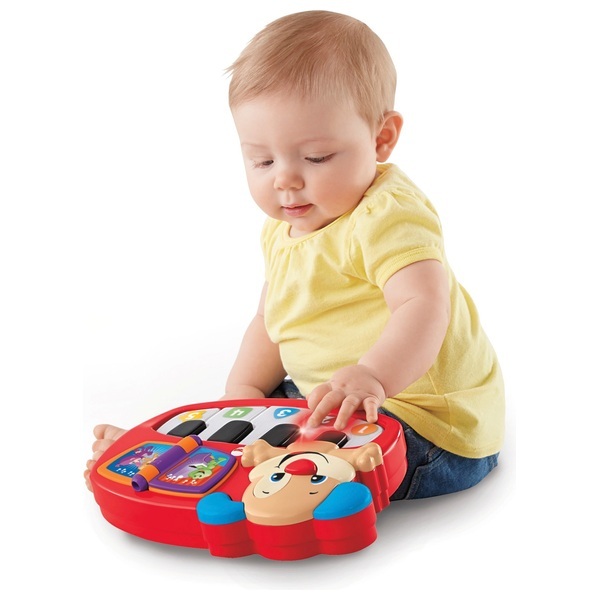 In Learning Mode, baby simply touches any of the 5 oversized light-up keys to be rewarded with phrases & songs about colours, numbers & shapes. In Music Mode, little music-makers can play their own tune, hear classics like "The Entertainer," or play along to familiar sing-along songs like "Happy and You Know It." And we’ve made it easy to take this concert on the road – just grab the handle and go!